August was the month Europe battled the elements. Unseasonal heavy rains, lack of sun, excessive heat and hugely destructive fires all played a part throughout the continent. Many crops peaked unusually early, particularly in Italy due to prolonged hot spells. It proved to be a challenging month for growers, pickers and greengrocers alike. We saw the end of the English Cherry harvest but the start of our Plums, Pears, and Kent Cobnuts. Climbing Beans, Sweetcorn, Courgettes and Summer Squash arrived too. 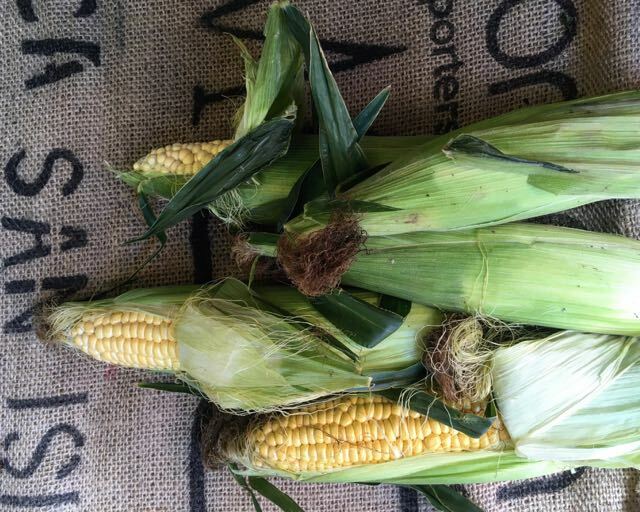 Plump cobs of the sweetest English Sweetcorn. Watercress, Runner Beans and Black Cabbage, direct from the Kent and Sussex farms we work with. The first English Early Maincrop Pink Fir Apple Potatoes and a few early Pumpkin Squash. New season English Pears, three varieties of Apple and purple streaked Marjorie Seedling Plums from our Kent grower too. Damson Plums and Kent Cobnuts again too. English Heritage Carrots, creamy white Cauliflowers, Bobbi Beans, Beetroot, several varieties of English Tomatoes, organic Courgettes and Squash and several types of firm, weighty Aubergines. Beautiful quality English Leeks are here also. Mushrooms are becoming more available and, this week, we have Scottish Chanterelles and Girolles as well as Ceps. Happily, once again, we have those wonderful Sorrento Vesuvio Tomatoes. The new season Onions are welcome arrivals. This week there are Strings of Cipolla Rosa di Tropea from Calabria and large, flat and sweet Cipolla Bianca di Giarratana from Sicily along with sweet, delicate-skinned French Oignon Doux des Cevennes. French Black Figs are particularly good and there are high season Muscat Grapes from France and strawberry perfumed Fragola Grapes from Italy. Also from Italy are large, juicy, pink-blushed Nectarines and those sunny orange, highly fragrant Percoca Peaches which are so good for cooking. September marks the move into Autumn. Our expectations and appetites move on too. So, what new season produce can we hope for during September? We expect to have English Sweetcorn, Runner Beans, Bobbi Beans, Aubergines, English Tomatoes, Courgettes and Squash well into September. 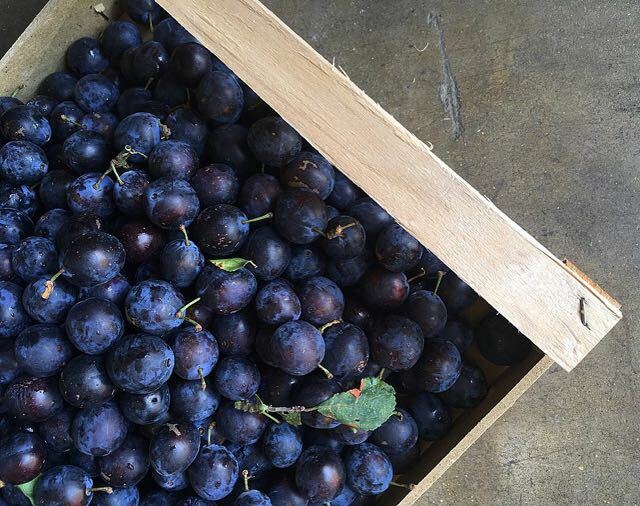 Plums from our Kent grower should arrive for a little longer, being replaced by the Apple and Pear harvest which is already underway. Kent Cobnuts will continue to be available too. English Heritage Carrots, creamy white Cauliflowers, Beetroot, Kohlrabi, Leeks, Watercress, Chard and Black Cabbage will be here throughout the month. We should also continue to have flavourful Tomatoes and new season Onion varieties from England and the rest of Europe. Varieties of English Maincrop Potatoes will be becoming in to join the Pink Fir Apple Potatoes which arrived this week..
Mushrooms should become more plentiful and varied this month with Scottish Chanterelles and Girolles as well as European Ceps leading. We can expectEuropean Black and Purple Figs and Muscat Grapes to continue. Autumn Squash and early varieties of Pumpkins will definitely be in. We may see some Miyagawa Green Mandarins and Pomegranates arrive. Last month, in our August News, we mentioned we would soon be formerly launching our new brand London Fermentary. We have been working hard to achieve this and are pleased to let you know that all of our in-house made fermented products, which we have gradually been introducing, now bear our new labels ‘LONDON FERMENTARY’. We have just launched a new website dedicated to our fermented products. Please take a look at LONDON FERMENTARY for more information. You will find all our ferments in our fridge as our Bermondsey business premises on Saturday, as usual. Please continue to enjoy them and, if you haven’t yet discovered them, please ask us about them. Any feedback you can give us will be welcomed. This will help us focus on the ones we should keep. Before those barbecues get stored away, here’s a suggestion for one last firing up. English Sweetcorn is particularly good right now, so, roasted corn-on-the-cob with a chilli butter to temper its sweetness fits the bill. Peel back the husks without removing and pull out the silk threads beneath. Wash the cob and the husks and put the husks back to their original position, twisting them at the top as tightly as you can (a little water trapped within will help the cooking). Cook over hot coals for about 30-40 minutes depending on size until the husks are well charred and the kernels softened. Meanwhile gently heat some butter and add thinly sliced red chilli to just soften then put to one side. Serve the cooked cobs, peeled of their charred husks, with salt, pepper and the chilli butter. (If you don’t want to cook over coals, strip off the husks and silks and cook the cobs in a pan of boiling water for 10-15 minutes (just remember not to add salt to the water as it toughens the kernels). We respect your privacy, will only use your information for our newsletter, and never share it.